Nike and Jordan Brand have been all about new technology and innovation over the last few years. Perhaps no technology speaks to that more than Nike's React technology which offers consumers an alternative to Adidas Boost. 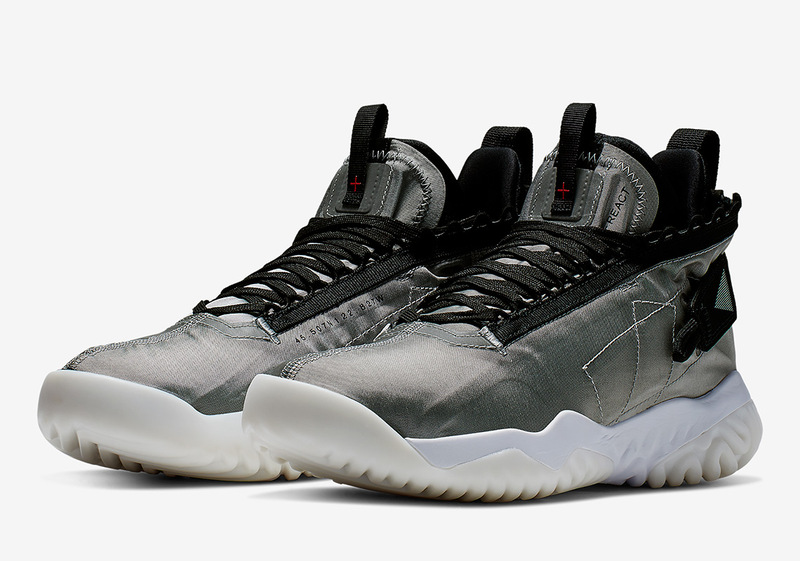 The Beaverton brand has been looking for all sorts of new silhouettes to place their technology on, and the new Jordan Proto React model is perfect for that. It's an odd looking mix between a lifestyle and performance basketball sneaker but is stylish enough for fans of Jordan Brand to get behind it. We've already seen the shoe in a black and white colorway and now we're getting it in white and silver versions that will be sure to turn a few heads. Both models have a utility look to them, with some extra bells and whistles dressing the uppers. The white model has an all-white upper with a black midsole, while the silver version has an all-silver upper with the same detailing as the white version. One difference though is that the silver model actually has a white and cream midsole. According to Sneaker News, these will be released within the next few weeks on Nike.com for $150 USD. Are you feeling the new silhouette or is it a pass?